We are famous! Or at least my kids think. My oldest son asked me if I get to meet Guy Fieri. My youngest son told me I should start charging friends when they come over for dinner. I am thrilled to tell you that Chile Pepper Magazine will be featuring Dinner Is A Crock in this month’s issue! 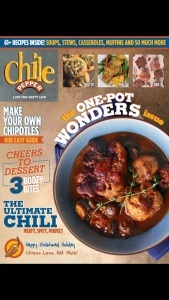 You can find a print copy or digital copy online from www.chilepepper.com. Welcome to my new fans! Please peruse the recipe index and pick a few new recipes to try. My go-to favorites include crockpot vegetarian lasagna and my monthly do of crockpot caramelized onions. With Thanksgiving quickly approaching, start thinking about what dishes you can cook in your crockpot and free up space in your oven for that bird! Try crockpot green bean casserole or crockpot spicy apple sauce as fabulous new side dishes. New recipes coming soon! Stay tuned!